Steve has lived in southern Oregon since obtaining his B.A. from U.C. Berkeley in 1979. He started Rogue Valley Electric where he is now a supervisor, and is experienced with builders, developers and the County land use process. His passion is preserving and restoring Rogue Basin farmlands and floodplain habitats. “Most of southern Oregon's river floodplains are critical habitat for endangered coho salmon and deserve protection. This has been largely ignored during the development process. 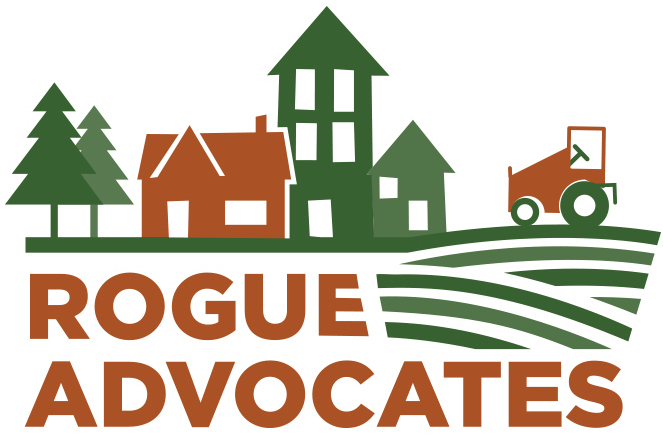 My Rogue Advocates work provides a voice for the voiceless.” Steve also serves on the North Applegate Watershed Protection Association board, co-chairs the Applegate Sustainable Aggregate Project and co-founded SAVE (Save Applegate Valley Environment). Mike is from Hugo in Josephine County. He earned his B.S./M.S. at OSU in natural resourcse and resource geography and did gradatue work in urban planning/resource geography at OSU and University of ORegon. He was a career land use planner and NEPA specialist with BLM. Mike's passion is informed citizenry and decision-making in Oregon's land use planning system and addressing cumulative impacts relating to the land's carrying capacity. His other current roles include: Hugo Neighborhood Association & Historical Society-Education Chair, Goal One Coalition-Director, Josephine Soil & Water Conservation District-Associate Director and NEPA Design Group-President. Jimmy has lived in the Williams Valley for 18 years. He is a carpenter, guitar maker, fine woodworker and subsistence farmer. He has been active for years in the protection of southern Oregon's native forests. Jimmy studied Environmental Education at Sonoma State University, was a docent at Fairfield Osborne Nature Preserve in Sonoma County, California and has served on the board of the Sugarloaf School, part of William's Sugarloaf Community Association. Jimmy is passionate about organic farming and permaculture and is interested in the promotion of sustainable land use for both rural and urban areas of this bioregion. Pepper is a professional wildlife biologist (Ph.D., Cornell University) and has been actively involved in the conservation and management of southern Oregon's public and private lands for over 10 years. He has been a leader in the efforts to establish the Cascade-Siskiyou National Monument, and to preserve the wildlife habitat provided by the Bear Creek Greenway. Pepper is past President and present Conservation Chair of the Rogue Valley Audubon Society. His goal is to preserve open space, farmland and wildlife habitat in the Rogue Valey, with the conviction that healthy communities depend on a healthy environment.